From time to time, I tend to get a little annoyed with the strict and structured look of most of my creations. Most of the time I love it of course, but not all the time. Owning a serger and being able to make things in jersey has improved this matter, but especially when it comes to tops, it will still hit me every once in a while. This time, the topic was the blouse. Most of mine are fitted and made from a fairly stiff cotton. It is shirtweight but tends to seem a bit starched and just never gets drapey. It happens to be one of the fabrics I can always buy at the local market, so it gets used a lot. I wanted something flowy, with a wider but still feminine fit and preferably still having the features of a normal button-down shirt. I made some muslins with a wider, undarted body shape and hated them all. Then I remembered this picture from an '08 magazine and decided to do something a bit like that. I drafted the pattern, including my widest sleeve to date. When sewing this, I loved my new sewing machine. The old one would have eaten such a delicate fabric. This one didn't even make it pull at the seams. 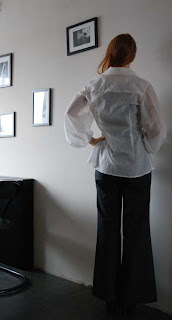 Because the fabric is a bit sheer, I used white organza instead of the usual lightweight fusible interfacing. I had never done this before, but it worked quite well. I just cut pieces with seam allowance and treated them as one piece with one of the pieces in fabric. What a beautiful blouse. The sleeves add so much to the garment. Lovely blouse! 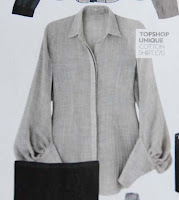 I especially love the softness of the sleeves. beeeauuuutiful... and i love that leather jacket in your banner too!